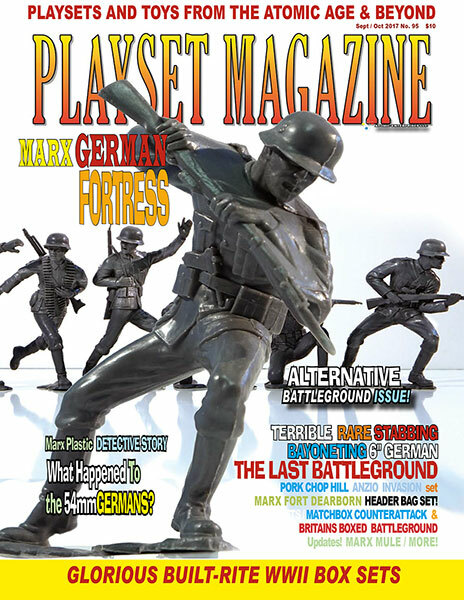 PLAYSET MAGAZINE ISSUE 95: ALTERNATIVE BATTLEGROUND! What an incredibly full war-torn issue we are delighted to ship (right on time as always!) to our friends and readers. So delightfully twisted, terribly demented and awfully Alternative Battlegrounds Issue. And while we have LOTS of non-Marx contributions to this battlefield mind-bender, we do also have lots of Marx! The cover is our big clue – and we do mean big – as to the lead story on Marx’s demented, terrible, awful, horrible Six Inch giant, the Downward Stabbing Nazi soldier – so distastefully nasty that it was completely pulled from the shelves – BANNED as it were, everywhere but right here on these “I Dare Ya To” pages! He’s quite rare, hotly sought, and very cool. What was his fate? Why was he replaced? What was so terrible? Can you take the full story of this gray monster, thrusting a viciously gleaming steel bayonet down into a no-doubt helpless victim? Of course you can! And it’s tied-in to yet another Marx rarity the Marx German Fortress. That’s right – Marx made the Marx No. 2124 German Fortress, so rare that most collectors have never seen or heard of because it too had almost non-existent distribution and no advertising. See them both on these pages! Many of us enjoyed Marx Alternative Battlegrounds, and several delightfully informed PMers have dedicated the time to write and photograph stories. This time we feature Francis Turner’s What the Heck! Fort Dearborn Header Bag set! Plus a report on the Wheeling Show! And what about -The Last Battleground – the real and actual last Battleground made featuring the Marx Germans and US GI’s. It’s also the hair-raising thriller the mysterious disappearance of the Marx Germans of shortly after the firm went under, that’s the subject of a real doozy: The Marx Detective Story -- What Happened to the 54mm Germans? We delve into exactly why there has never been a set of reproduction Marx 54mm WWII Germans, a tale that needed the help of Matt Murphy, Jim McGough and more helping Rich Fisher tell the story of THE LAST BATTLEGROUND. Guaranteed to please! You’ll delight in the toy makers art when Kirk Larsen visits far away battlefields with the Pork Chop Hill & Anzio Invasion playsets. Great art on those boxes and we always wanted to know what was inside them. This one satisfies the soul. Next on our alternative minds was Bobby G Moore's adventures with Matchbox’ Counterattack with its firing armored car and ruined buildings forming a village center. Quality figures and accessories reign here, and possibly something new for your collection too. Then comes Britains Battleground and if that’s not enough, add in those famous American Bilt Rite Sets. For a little fun and down-home comical amusement, The Caulking Gun Incident will take you back to a time when “I’m a kid, darnnit, and I’ll do what I want to!” misguides your judgement -- Even when Dad told you no. Lastly, we’d like to announce that the new Marx Civil War Book is finally ready for prime time, and is available. It’s bigger better fresher and contains every Marx Blue & Gray playset profusely illustrated and with contents lists, discussions on differences, and so forth. Very complete and vetted by the world’s best authorities. Look on the back cover of this issue and also on this website for details. So that’s our most unusual entertainment offering. The Alternative Battleground Issue! We do hope you’ll enjoy it and let us know. The issue goes out Friday August 25th. Remember its Labor Day too - First Class subscribers should have it a few days later up until 2 weeks, and the standard raters can allow 2-4 weeks they tell us.